To rescue the world’s largest tunnel-boring machine — and the future of the Highway 99 project — you need one of the world’s strongest cranes. The Mammoet Co. has been gathering and erecting steel parts since September from Malaysia, Europe and Canada, to prepare to lift 4 million pounds along the Seattle waterfront sometime in the next few weeks. That’s where tunnel drill Bertha has been stranded underground for more than a year, awaiting front-end repairs. There’s no crane that just does this. This modular lift tower was custom-engineered to fit the limited space next to the Alaskan Way Viaduct, and to steer its payload within millimeters of a target. “That’s why I like working for this company. It’s like a big Lego box full of stuff,” said Jaroen van Kooperen, the 37-year-old project manager responsible for the high-tension lift. Millions of dollars are being devoted to a few moves — to lift the damaged drive assembly, spread the pieces over the ground, and eventually return the refurbished section to the repair vault 120 feet below. The family-owned Dutch company is known for retrieving the wreckage of Russian naval sub Kursk from the bottom of the Barents Sea in 2001. The name “Mammoet” means mammoth. To find a lift of comparable audacity, Northwesterners can look to Portland’s Sellwood Bridge, where a steel-truss span above the Willamette River was jacked and relocated 33 to 66 feet north in January 2013 by Oregon-based lifting specialist Omega Morgan, which also slid a new concrete span of the I-5 Skagit River Bridge into position that summer. Bertha’s entire front end is similar in weight to a space shuttle before takeoff. But it really behaves more like a submarine. Besides the cylindrical shape, the drill sits in watery soil that exerts four times atmospheric pressure, as if 105 feet undersea. Seattle Tunnel Partners (STP) is building a huge ring-shaped vault, where the crane can safely retrieve Bertha’s cutterhead in open air. The fill soils that settlers dumped a century ago are too soft to withstand a mammoth payload, so supporting beams and platforms have been installed. Beyond the technical drama, the Washington State Department of Transportation needs for something to go right, during what Transportation Secretary Lynn Peterson has called a “pretty tense moment” in the machine’s journey from Sodo to South Lake Union. Bertha remains idle since overheating more than a year ago. The soil in nearby Pioneer Square has sagged an inch, and City Council members are becoming unnerved. “People really want to see Bertha moving again, and really to come out the other end, before they have much faith in DOT, or any of the other big projects that are being proposed” in a potential $10 billion transportation package, said state Rep. Ed Orcutt of Kalama, ranking Republican on the House Transportation Committee. Mammoet is being paid by tunnel-machine maker Hitachi. STP did not answer a message seeking cost information. Chris Dixon, project manager for STP, notified the state in early 2014 that the full cost of repairs, the access pit and other unexpected project costs could reach $190 million. • Buried foundations. 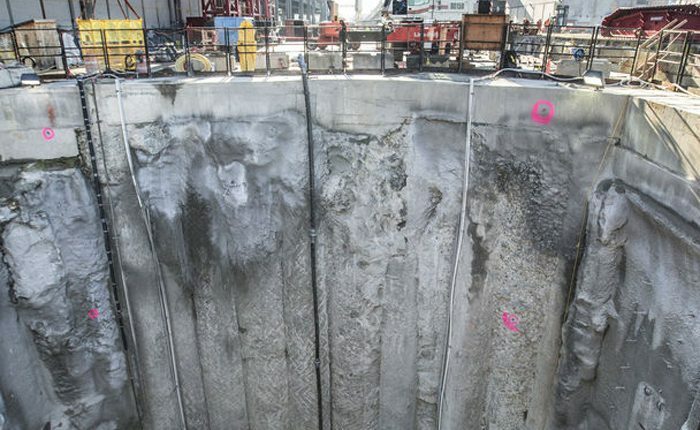 Before tunneling began, crews planted twin rows of concrete pillars to the left and right of Bertha’s route. This protective box in the soil shields the viaduct from vibrations when Bertha digs. Those walls can now serve a second purpose for the lift. The crane tower is designed to straddle the tunnel machine with legs 74 feet, 6 inches apart, so they match where the concrete walls are — like a mountain climber standing on two stones over a crevasse. And yes, engineers improvised this. “When the piles were put in, it was never fathomed that we were going to need a Mammoet crane,” Greg Hauser, STP deputy project manager, said while he paused to view the access pit Tuesday morning. Because concrete is strong in compression, the tops of the buried walls ought to support the 1,300-ton tower crane plus its 2,000-ton load. • Hydraulic balancing. Van Kooperen compared the crane tower to a kitchen table, and said any weight shouldn’t be allowed to shift much. So the crane legs are perched over 48 hydraulic cylinders, instead of directly on the track rails. It’s a first in the industry, that a tower is wholly supported by hydraulic components, said van Kooperen. He said it exploits Pascal’s law, which says pressures on fluid within a closed system are transmitted equally in all directions. So as Bertha’s pieces move, the tower automatically rebalances itself. • Safety precautions. On commercial-construction jobs across the city, it’s common to see workers standing beneath bundles of lumber, Sheetrock or steel, and for somebody to guide a load using ropes. Two Highway 520 pontoon builders at Grays Harbor were almost hit by a concrete counterweight that suddenly broke loose last year. Not so with Bertha. While the nose is detached, the team will control it using four chains that extend outside the access vault. There will never be any workers under a live load, van Kooperen said. One group of motors and cables will hold the suspended front end of Bertha, while another set lowers and tilts the segment 90 degrees, so the cutter face can be flat on the ground. Post-repairs, the sequence would be reversed until Mammoet reunites the front end with the rest of the tunnel machine, at the floor of the 120-foot deep vault.